청량사터에는 칠층석탑과 오층석탑 등 2기의 석탑이 남아 있는데, 이 두 탑을 가리켜 오누이탑 혹은 남매탑이라 부르기도 한다. 옛날에 상원이라는 승려가 어려움에 처한 호랑이를 구해주자, 호랑이는 이에 대한 보답으로 처녀를 업어다 주었다. 상원은 처녀와 남매로서의 관계만을 유지하며 수도에 정진하였고, 처녀의 아버지는 그 갸륵한 뜻을 기려 두 탑을 세웠다는 전설이 내려온다. 이 탑은 그 중 칠층석탑으로, 1단의 기단(基壇) 위에 7층의 탑신(塔身)을 세워 두었으며, 전체적으로 폭이 좁고 길쭉한 형태이다. 기단은 각 면의 네 모서리마다 기둥을 딴 돌로 세운 점이 특이하다. 탑신은1층 몸돌의 한 면에 직사각형 모양의 감실(龕室:불상을 모셔두는 방)을 새겼다. 지붕돌 밑면의 받침수는 1층이 2단이고 7층이 1단이며, 2·3·4층은 후대에 만든 것이라서 원래의 모습을 확인하기가 어렵다. 2층 지붕돌 낙수면의 경사가 1층 보다 급하고, 2∼7층까지 몸돌이 줄어드는 비율이 그리 크지 않아 탑 전체의 안정감과 균형을 해치고 있다. 꼭대기에는 머리장식이 모두 없어지고 이를 받치던 네모난 받침돌만 남아 있다. 전체적인 수법으로 보아 익산 미륵사지 석탑(국보 제11호), 익산 왕궁리 오층석탑(국보 제289호)으로 이어지는 석탑 양식의 특징을 보여주고 있다. 일부 없어진 부분이 있지만, 위로 올라가면서 과감하게 생략된 부분이 있고, 세부적인 조각수법이 일정하지 않은 것으로 보아 고려 중기에 만들어진 것으로 짐작된다. The site of Cheongnyangsa Temple contains two stone pagodas, called brother-sister pagodas: a seven-tiered one and a five-tiered one. According to legend, a monk named Sangwon got a tiger out of trouble. The tiger brought a maid to the monk supposedly in return for the gesture. The monk applied himself to Buddhist enlightenment and treated the maid as if she were his own sister. Her father thought highly of the monk’s purity in mind and built the two pagodas. 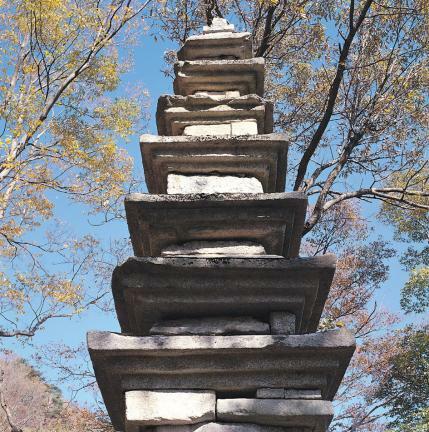 The seven-tiered pagoda stands on a single-tiered platform and has a thin, long shape. This one is unique, since its platform has columns on the four corners separated from the platform. The first tier of the body has a rectangular niche. As for the bottoms of the roof stones, the one for the first tier is two-tiered, and that for the seventh tier is single-tiered. Those for the second ~ fourth tiers were replenished later, and there is no way of knowing about their original state. The roof stone of the second tier shows a sharp slope. The second ~ top tiers have a rather unstable and unbalanced proportion. At the top of the pagoda, only the square bottom that used to support the stupa finial is left. 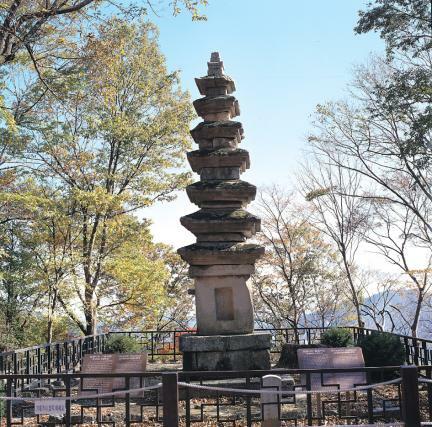 This pagoda is presumed to have been made in the mid-Goryeo Period (918-1392) based on the fact that some details were omitted in the upper parts and that the minute sculpturing techniques are not uniform. 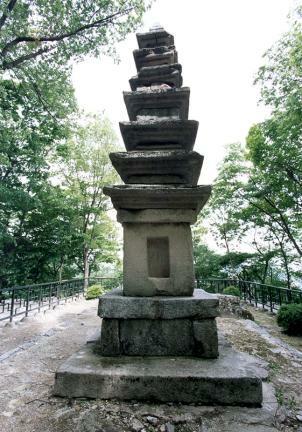 The overall techniques used show that it follows the styles of those made during the Baekje Period, like the Stone Pagoda at Mireuksa Temple Site, Iksan (National Treasure No. 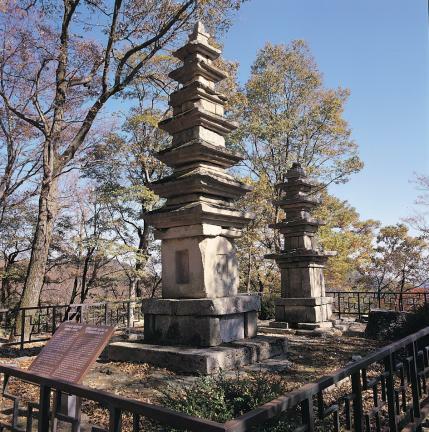 11) and Reliquaries from the Five-story Stone Pagoda in Wanggung-ri, Iksan (National Treasure No. 289).